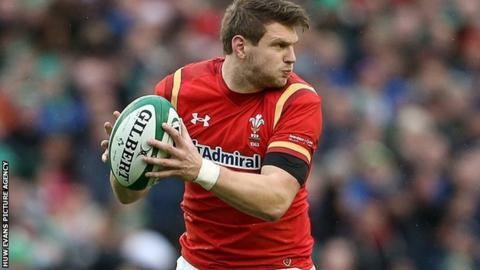 Dan Biggar will start Wales' Six Nations clash against Scotland in Cardiff on Saturday after recovering from a sprained ankle. Biggar limped out of Sunday's 16-16 draw with Ireland in Dublin and was replaced by Rhys Priestland. Bath's Priestland is named on the bench, with Liam Williams retaining the full-back shirt in an unchanged side, ahead of fit-again Gareth Anscombe. Centre Jonathan Davies will make his 50th appearance for Wales. Ospreys flanker Justin Tipuric retains the number seven shirt with captain Sam Warburton on the blind-side and Dan Lydiate on the bench. "It's great to be able to name an unchanged side, with Dan coming through, fit and ready to play," said Wales coach Warren Gatland. "It's a reward for some players who put in a great shift in Dublin whilst we will be asking a little more of some of the players as well. "It's great to see Jonathan reach his 50th cap and continue his impressive international partnership with Jamie in the midfield. "We were impressed with the impact from the bench last week and that will be just as vital this weekend in what's going to be a tough battle." Scotland have made one change to their team following the 15-9 loss to England at Murrayfield. Duncan Taylor comes in for injured Matt Scott in the centre as the Scots chase their first win over Wales in Cardiff since 2002. Wales team: Liam Williams (Scarlets); George North (Northampton Saints), Jonathan Davies (ASM Clermont), Jamie Roberts (Harlequins), Tom James (Cardiff Blues); Dan Biggar (Ospreys), Gareth Davies (Scarlets); Rob Evans (Scarlets), Scott Baldwin (Ospreys), Samson Lee (Scarlets), Luke Charteris (Racing 92), Alun Wyn Jones (Ospreys), Sam Warburton (Cardiff Blues, Capt), Justin Tipuric (Ospreys), Taulupe Faletau (Newport Gwent Dragons). Replacements: Ken Owens (Scarlets), Gethin Jenkins (Cardiff Blues), Tomas Francis (Exeter Chiefs), Bradley Davies (Wasps), Dan Lydiate (Ospreys), Lloyd Williams (Cardiff Blues), Rhys Priestland (Bath Rugby), Gareth Anscombe (Cardiff Blues).